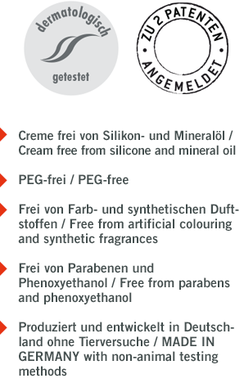 The DERMAGICO® Skin Care System is based on three stages: - DERMAGICO – DIE SYSTEMPFLEGE! CLEAR SKIN AT LAST ! Cleansing, reduction of pimples and blackheads, skincare. The first stage in our skin care system is cleanising. DERMAGICO Cleanser ensures the removal of excess sebum and environmental residues from the surface of the skin, mildly and thoroughly. In the second stage, the application of Tonicum toning lotion reduces spots, pimples and impurities in a natural way without drying the skin. Finally, to prevent new impurities from forming, a moisturiser with a sophisticated blend of botanical compounds is applied to normalise the skin flora. This product is available in two different intensities: Cream Light and Cream Rich. Through regular use of the DERMAGICO® Series the complexion becomes noticeably more harmonised. In addition to hyaluronic acid, the moisturiser contains further well-known anti-aging substances. Altogether the DERMAGICO® Skincare System helps you to achieve a noticeably more beautiful and clearer skin. *Result of a continuous cosmetic application; the results shown are not necessarily applicable to other users.